Robben Ford performed more than ninety minutes of non-stop craftsmanship to a very appreciative desert town crowd at The Rhythm Room, Phoenix, Arizona. The set list contained a pleasing baker’s dozen plus one encore of songs both from his current release, ‘Into the Sun’ (Mascot Label Group, NY, NY USA) and a potpourri selection from his vast catalog of work. Perhaps the show was extra spirited as it was the last stop on his current 2015 tour prior to departing for a few shows in France. None-the-less, the sound mix and tone was amazing partly due to vintage amp and obvious journeyman chops from Robben and the others. Each member of the group more than held their own when given featured solos and as a unit throughout the performance. The set kicked into high gear with ‘Just Like It Is’ from the 1997 Tiger Walk release followed up with ‘Howling At the Moon’ from the new CD. Ford dove into an extensive bridge solo more than demonstrating his talent and command of his rosewood-necked Telecaster. 2014’s A Day in Nashville cut, ‘Midnight Comes Too Soon’ preceded ‘Same Train’ then ‘Rose of Sharon’ featuring guitarist, David Grisson who ripped into his PRS as if it were the last song he was ever going to play. Great stuff! Wes Little. Returning to finish ‘Capers’, the band took a breath, allowing Robben to switch to his sunburst Stratocaster for two songs from his ‘Renegade Creation’ Bullet release. ‘People Like Me’ and the soulful ‘Nazareth’ with Griss playing acoustic. The back half of the show included ‘Indianola’ from the Soul on Ten CD, the 2013 Fool’s Paradise and a wonderful and rousing version of ‘Lovin Cup’, first performed on stage by Ford in 1998 as part of the ‘Robben Ford and the Blueline Authorized Bootleg’ and seen on the 2005 ‘New Morning, The Paris Concert’ DVD. The crowd was not about to go without an encore! Graciously, the band sent everyone home with ‘All Over Again’. Thanks to the band and staff at the Rhythm Room, unofficial home of the Phoenix Blues Society and owned/operated by harmonica pro, Bob Corritore. 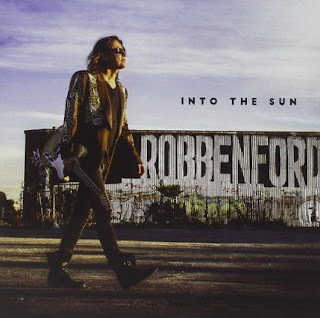 Strong recommendations to catch Robben Ford and band when they return from France and play California and Colorado in late July and August before heading to the East Coast in the Fall.